With equities closing moderately higher, the VIX settled -11.8% @ 16.07 (intra low 15.65). Near term outlook offers renewed equity downside to the sp'2050s, which should equate to VIX 19s. A sustained break into the low 20s looks difficult. A pretty significant net daily decline... but VIX remains broadly battling higher. I would be surprised if we don't see VIX back in the 19s tomorrow/early Monday. 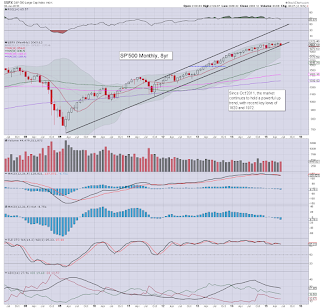 US equities indexes closed moderately higher, sp +14pts @ 2077 (intra high 2082). The two leaders - Trans/R2K, settled higher by 0.1% and 0.2% respectively. 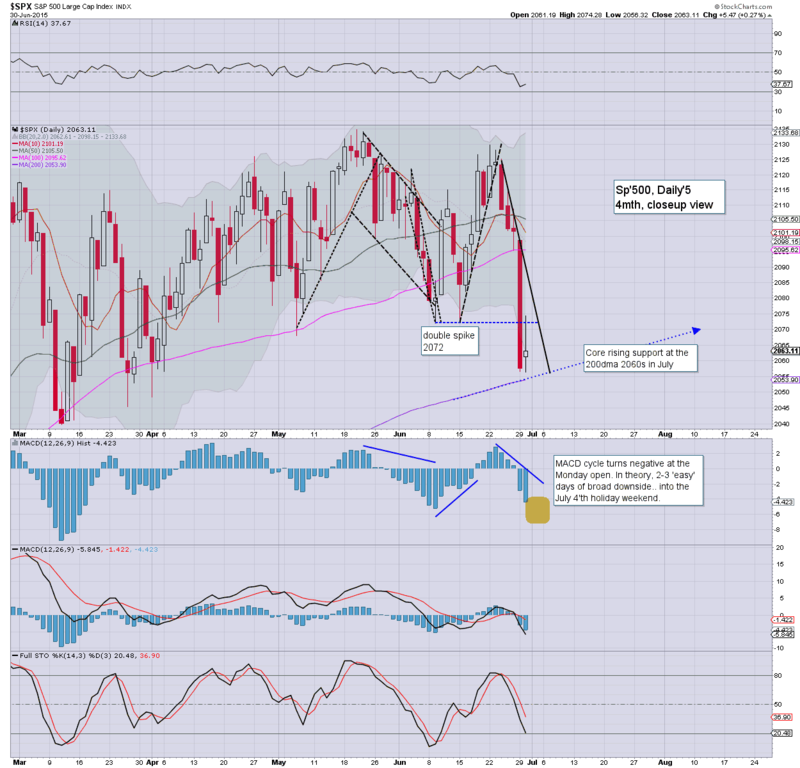 Near term outlook offers renewed weakness into the Thursday/weekly close, as the Greek drama continues. 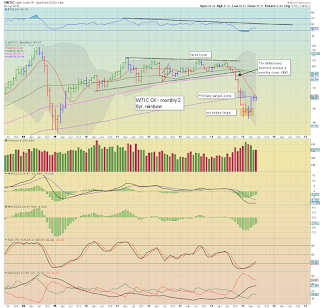 Suffice to say... early gains to sp'2082... but notable cooling to 2069 as the market remains very vulnerable to sporadic 'spooky Greek news'. 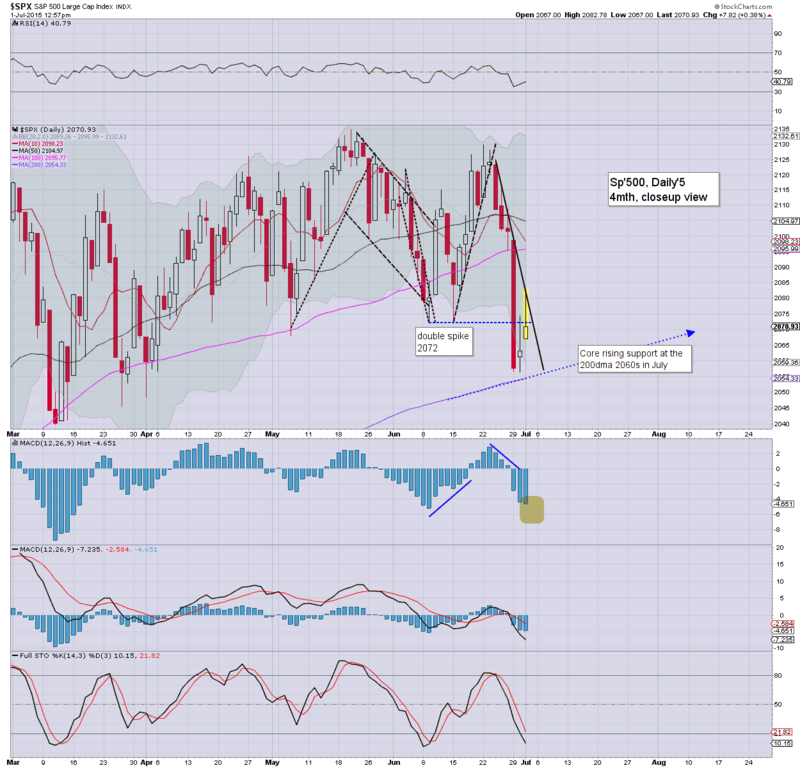 The sp'2050s look due again... before the market has an opportunity for sustained upside. 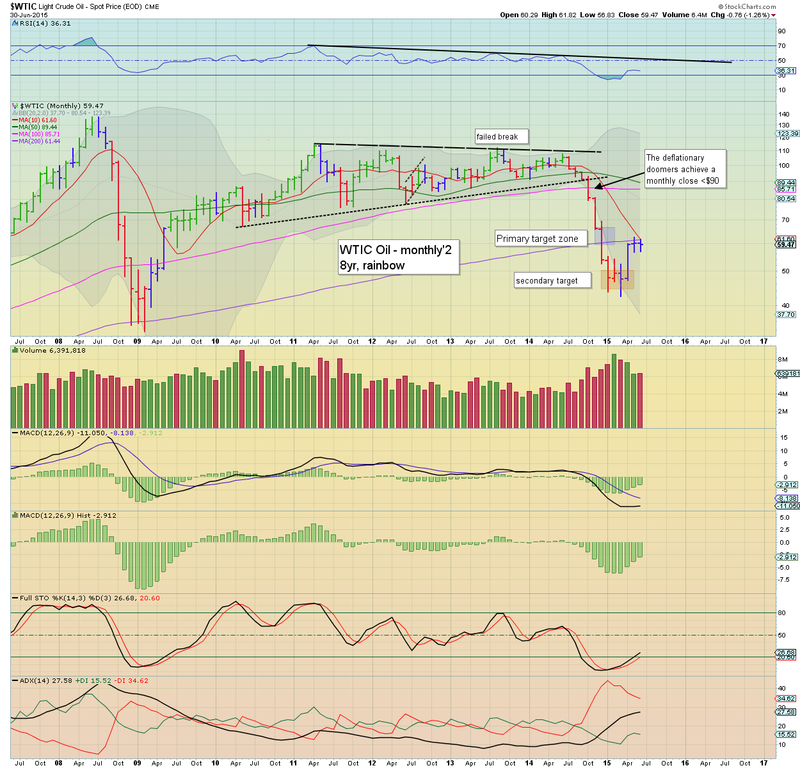 US equities look set for some mixed chop into the close, as the Greek drama will no doubt continue into early next week. 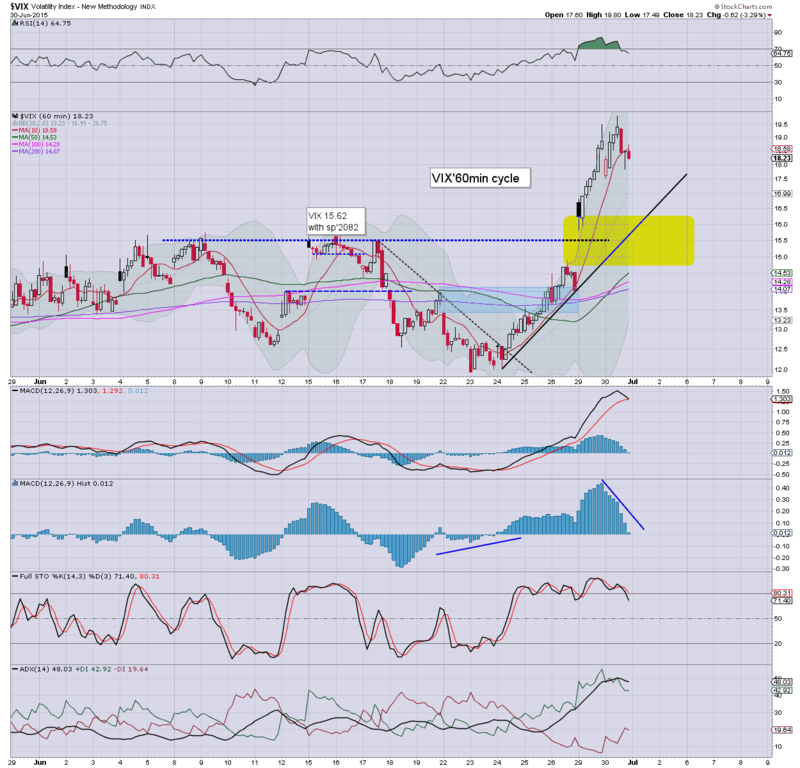 USD is holding sig' gains of 0.8% in the DXY 96.30s.. and that is a problem for commodities, Gold -$4, with WTIC Oil lower by a rather severe -4.1% in the $56s. *broader price action in Oil is starting to turn outright bearish with the first red candle since early January, having failed to hold the important $57s. Suffice to say.. interesting day... lets see if the market can unravel into the close. Price structure is a baby bull flag on the smaller cycles... suggestive of upside.. but I find that difficult to believe.. considering the current uncertainty. The morning high of 2082 is out of range in the closing hour, and I'd expect the 2050s before the market has a sustained hope of pushing back above the 2100 threshold. 3.40pm.. upper bol' on the hourly cycle 2083... will be difficult for the bulls to break above there. 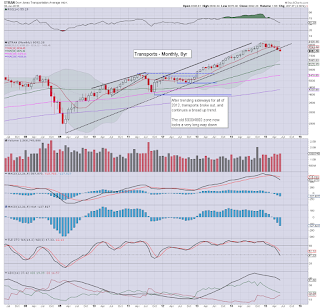 Equities are seeing some minor chop, having cooled from sp'2082 to 2069. Equity bears should be seeking renewed weakness into the close, back under the hourly 10MA.. which will be around 2071. With the USD +0.8% in the DXY 96.20s, commodities are under increasing pressure, Gold -$3, with Oil -3.8%. *I'm still unclear as to whether a mid term floor is in for the USD. 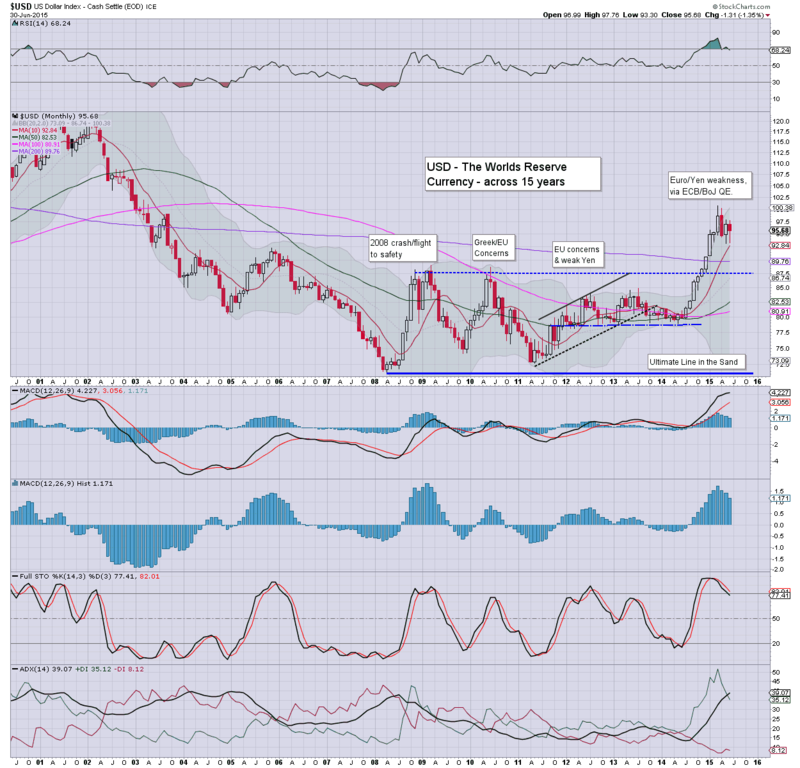 If the Greek drama can cool down across July and into August, the USD might yet cool back lower.. but its looking less likely. Broadly, there is little reason why the market won't cool into the close.. and across tomorrow. 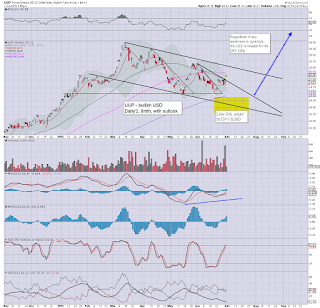 Despite the normal issue that trading volume will be light.. the Greece referendum is a significant issue, and I would expect some of the rats to sell into the weekly close. 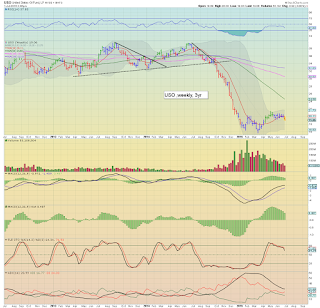 notable weakness: CHK, -4.8%.. as energy prices slide. US equities appear in the early phase of a rollover... with viable downside into the Thursday/weekly close.VIX is reflective of at least some continued market concern, back into the 17s.. having spiked from a morning low of 15.65. Oil continues to slide, -3.2%.. as supply is simply too high. *daily cycle is more indicative of the failed rally today - a clear spiky top, a net daily decline would offer clarity that the 2050s will be tested tomorrow. So.. early high of 2082.. and we're already back to 2070... a daily close in the 2060s looks rather probable.. with VIX 18s. There is little reason why we won't see at least some selling into today's close.. and across tomorrow.. as the Greek drama continues to unsettle a fair few. US equities are holding moderate gains, sp +12pts @ 2075.. (intra high 2082), but look increasingly vulnerable this afternoon. Hourly MACD cycle is set to rollover before the close. 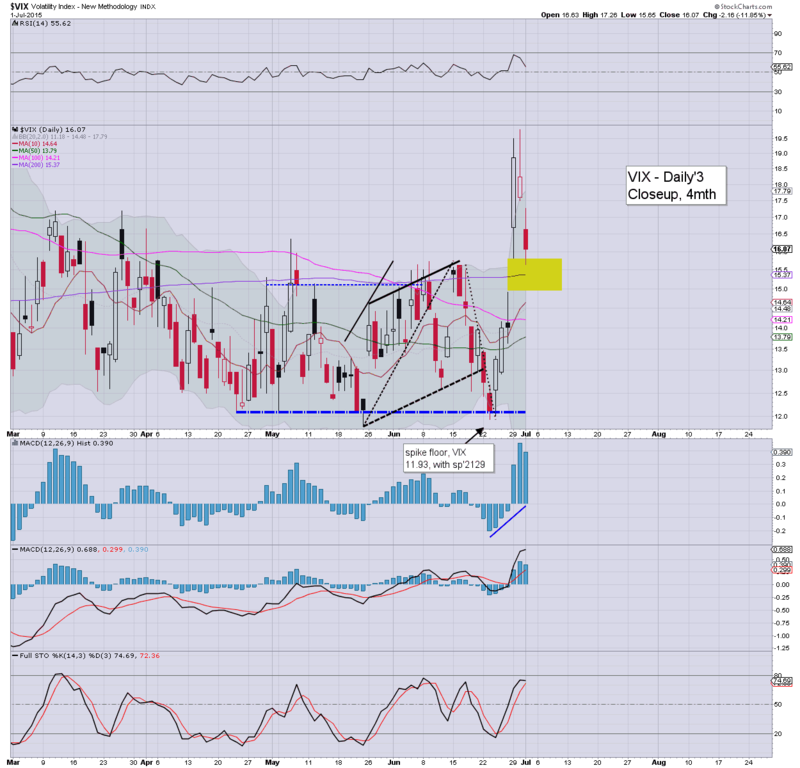 VIX is offering a spike floor of 15.65, with viable upside to 20/21.. if sp'2055/50 zone by the Thursday/weekly close. Some mild equity chop, the hourly MACD cycle looks set to rollover in the late afternoon. Again, its a case of 'who wants to be long into the holiday weekend? 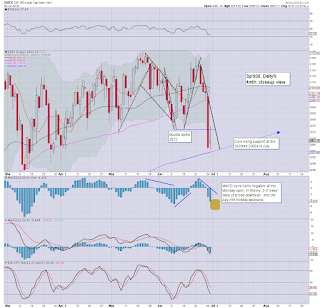 In theory, market should see at least some degree of weakness... a full test of the 200dma of 2054 still seems viable. 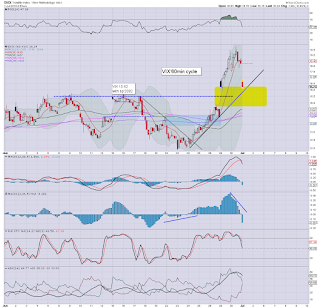 notable weakness: INTC -1.1% around the $30 threshold.. The low 29s look due.. before first chance of a bounce... and that is a good indirect signal that the broader market is still vulnerable into the weekend.. and early next week. time for some more ice. 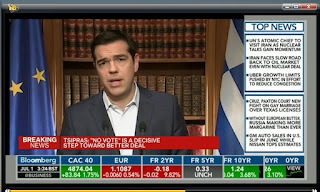 Tsipras is addressing the Greek nation once again, confirming the referendum this Sunday.. and calling for a 'no' vote to the bailout offer. 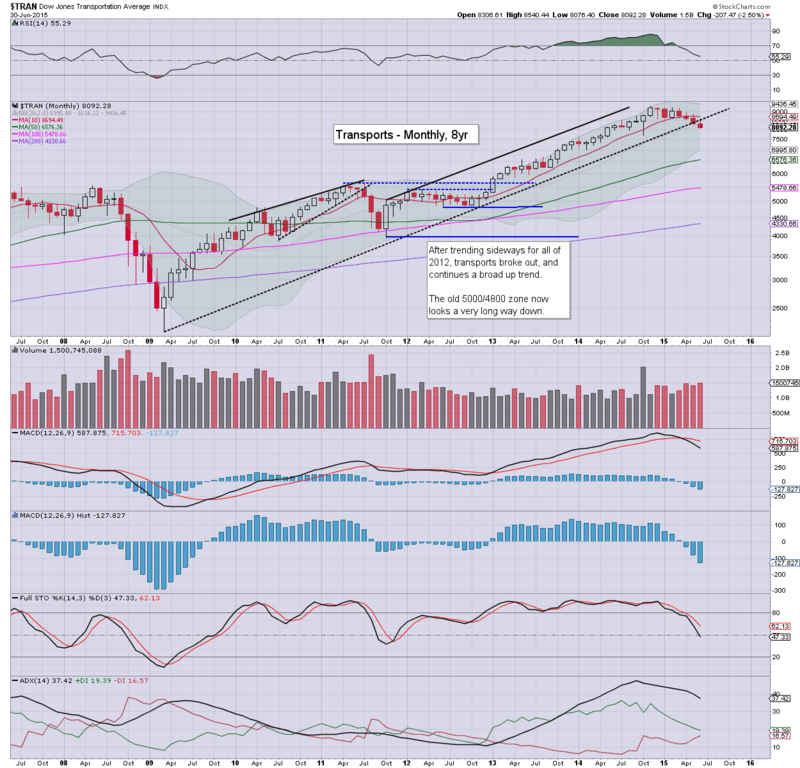 Equities remain stuck under declining trend/resistance.... and there is high threat of renewed weakness into the Thursday/weekly close. More talk... more market upset. *a very clear bullish engulfing candle on the VIX hourly chart.... bodes strongly to the bears for rest of today.. if not also tomorrow. 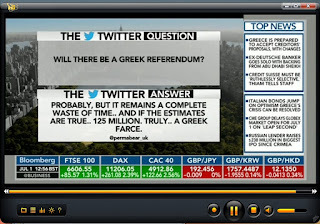 A long day ahead still.. and no doubt.. more sporadic Greek headlines will appear. Hourly equity MACD cycle will likely rollover into the close... offering the sp'2050s tomorrow. 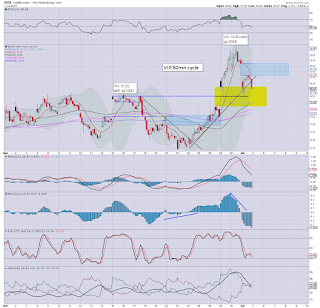 There are a great many individual movers... hard to choose what to highlight..
notable weakness: INTC, -1.2%.. set to lose the $30 threshold.. headed for $29.00... which should mark a low in the broader market. 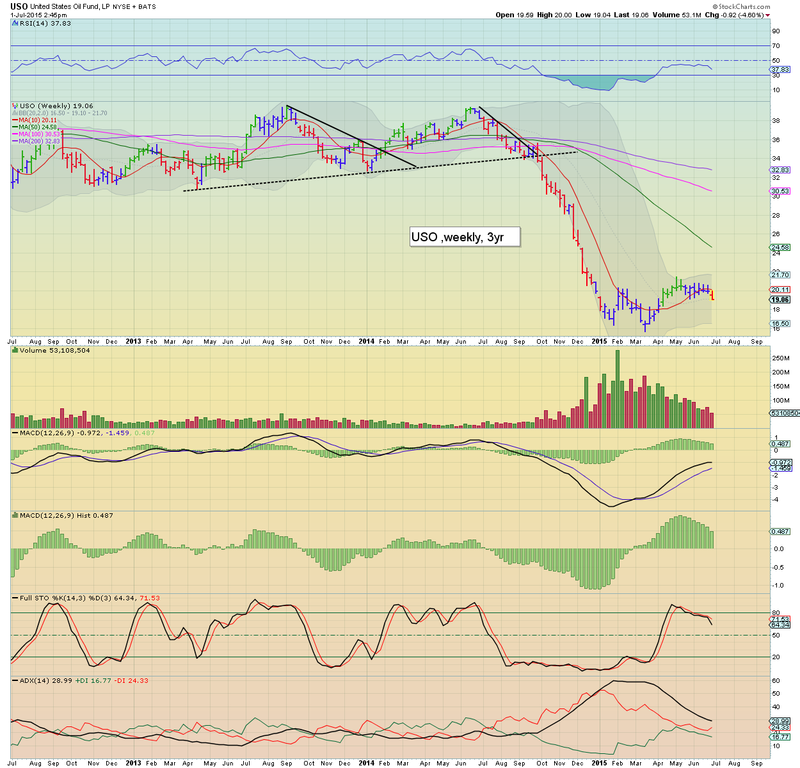 Oil/gas drillers, RIG -3.5%, SDRL -4.3%.. as Oil prices drop.. over supply remains the problem... NOT demand. 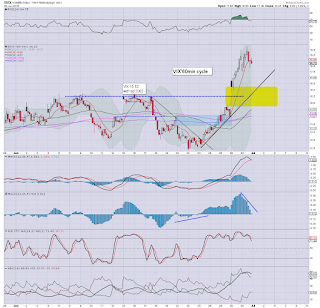 AA -1.9% in the $10s.... 9s look due by Sept/Oct. 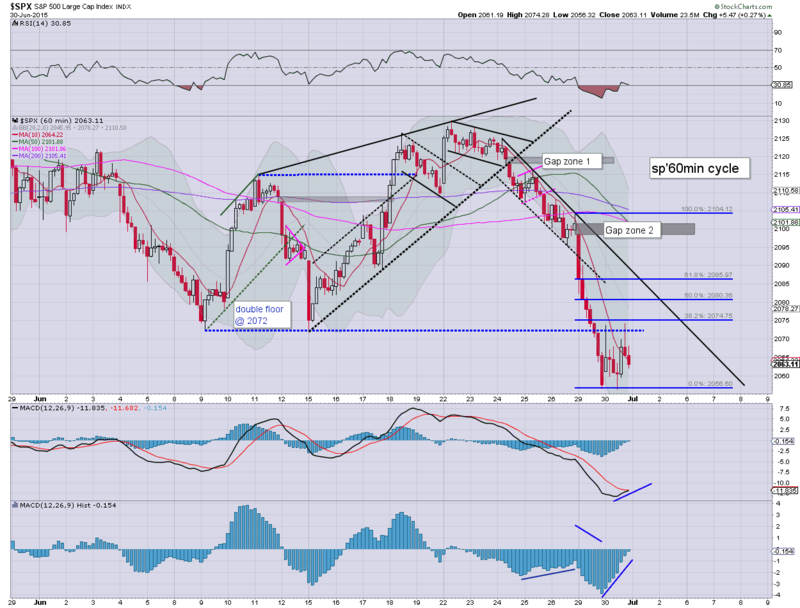 US equities open with somewhat significant gains, however, until the bulls can break >sp'2085.. the market remains vulnerable.. not least with a long holiday weekend ahead when the Greeks are set to vote. 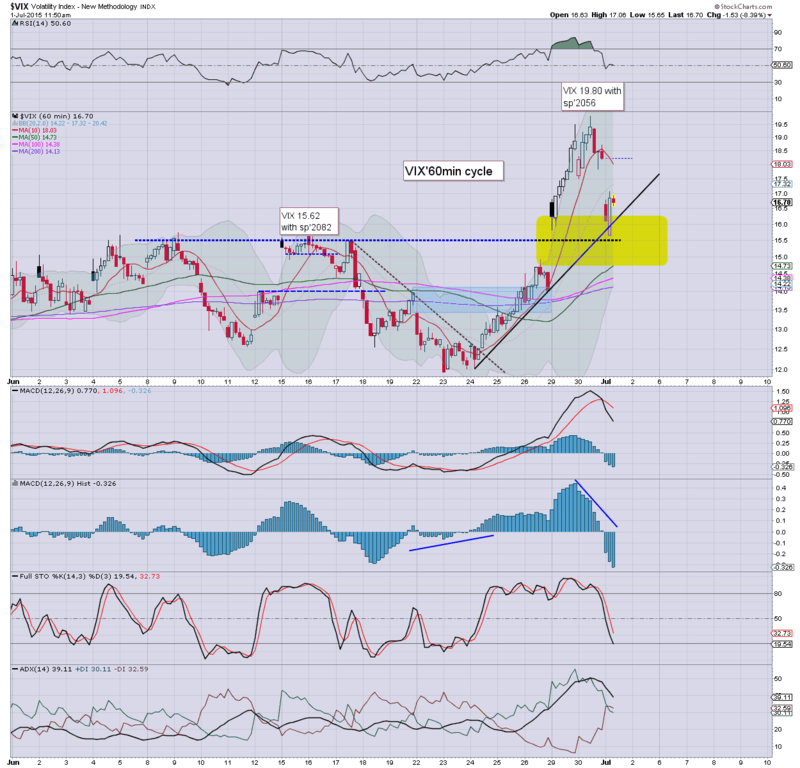 USD is building gains of 0.6% in the DXY 96.00s. Metals are weak, Gold -$4, whilst Oil -1.7%. Daily cycles (will highlight later).. are turning back upward... but.. there is no clear floor yet. Unless the bulls can break >2085.. there is the threat of renewed weakness into the weekly/Thursday close.. as some of the rats will surely sell ahead of the Greek referendum. 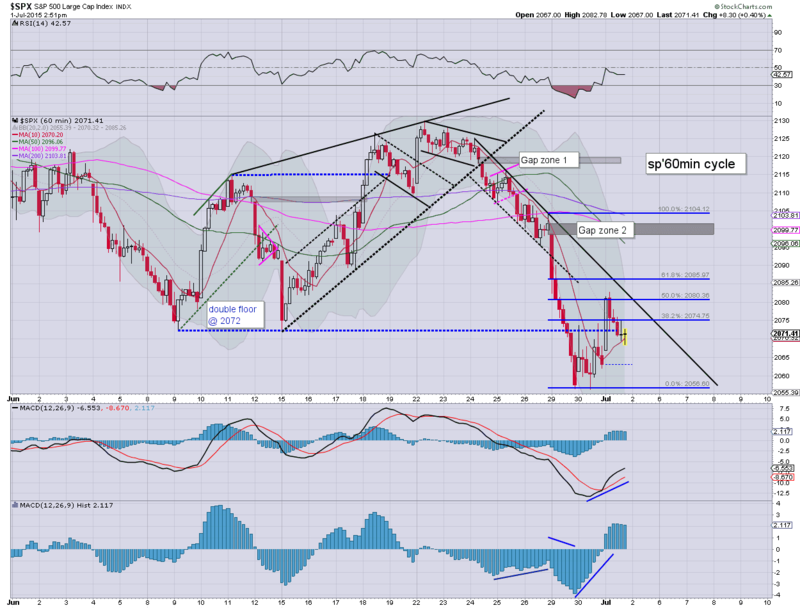 To me.. going long after another foray into the sp'2050s would seem a far better idea... and not until after the holiday break. For now... 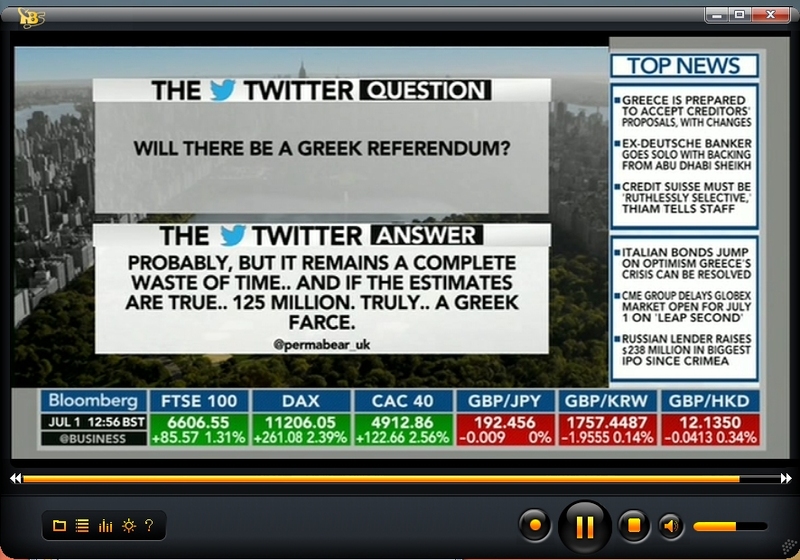 I'm content to watch this nonsense... and remain awaiting Tsipras who is set to address the Greek nation at some point today. notable movers: FB +1.9%... with a contrast TWTR -1.3%.... probably one is being traded off the other. 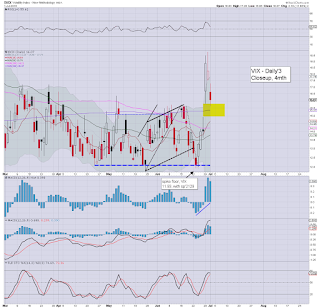 TVIX/UVXY, both lower by around -11%... as VIX is crushed into the big gap zone. FAZ -4%.. as talk of higher rates.. is helping the financials. 10.01am.. ISM/PMI manufacturing.. both come in 'reasonable'.. certainly better than the recent run of recessionary Chicago PMIs. 10.31am.. Net build of 2.4 million barrels... which is lousy considering its summer. meanwhile.. sp' getting stuck.. sp'2079.. hourly cycle will be rolling over later today... offering weakness into the weekly close. 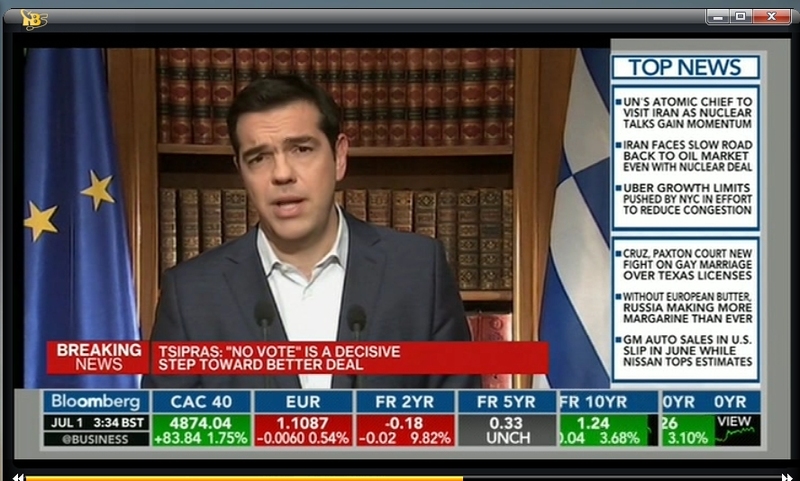 Tsipras is talking.. and he is upsetting the market. *referendum going ahead.... still calling for a 'no' vote. Good morning. Futures are sharply higher on yet another Greek headline that Tsipras might actually look to agree to a deal... and cancel the referendum. 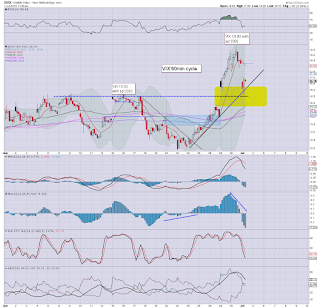 The sp'500 is set to open +20pts @ 2083. 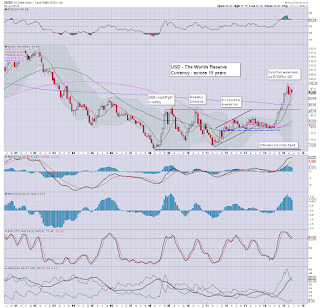 USD is climbing, +0.4% in the DXY 95.80s. Oil is cooling on the API report, -1.2% in the $58s. Welcome to July.... and its starting off with more Greek drama. Tsipras is due to address the nation 'soon'... all sorts of crazy rumours are flying around. 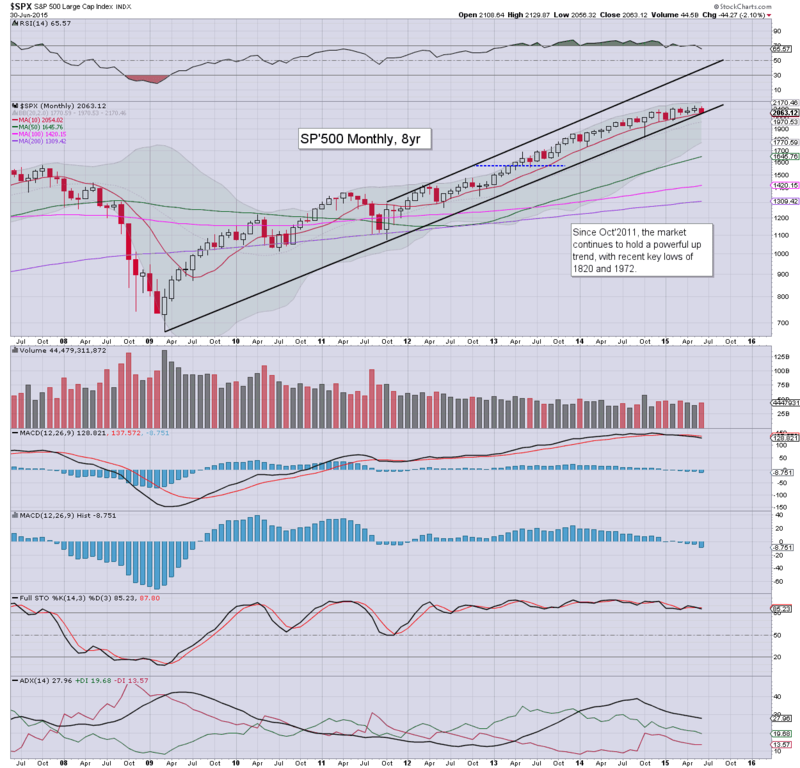 *something to watch for at the open, upper monthly bol' band on the sp'500.. that remains a valid 'last lunge higher' target for August... probably in the 2165/85 zone. I agree on the short metals trade.. but for now... I'm leaving them alone until USD is lower. Not surprisingly, China saw yet another set of crazy swings.. opening moderately lower.. a little chop.. but then rapidly unravelling in late afternoon, settling -5.2% @ 4053. 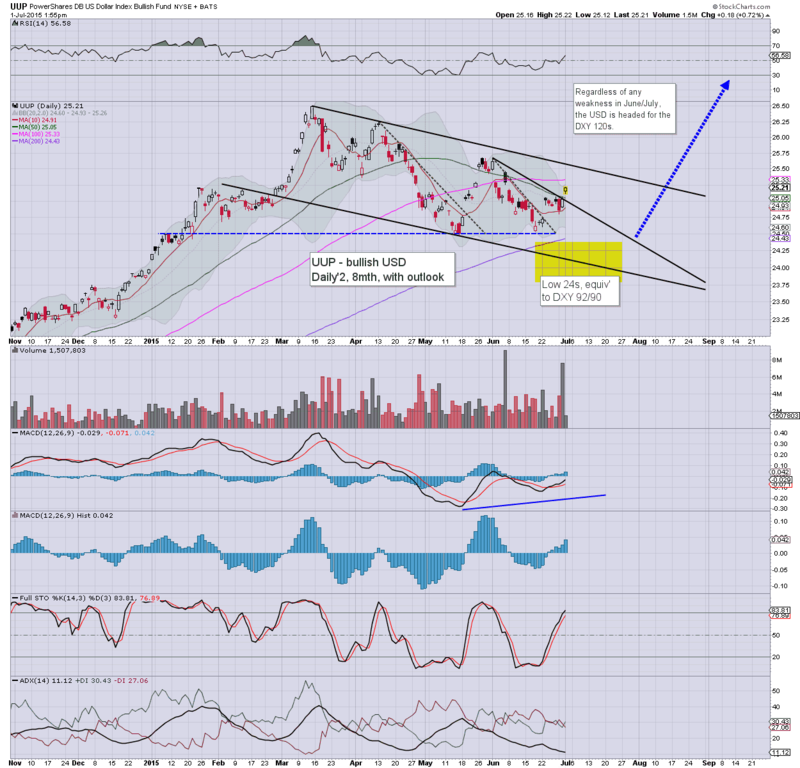 The 3400s still look the natural target this summer. Have a great day.. and month. 7.23am.. notable early weakness, TVIX/UXVY -9.5%... VXX -4.5%.. as the VIX is set to get whacked into the price gap zone of 16/15s. Well, I guess if you are into wave counts... call Monday a sub'3.. and we're still due a 5.. maybe to formally test the 200dma around 2054.... by late Thursday.. and then UP. For now.. I'm tired.. and in some ways, I'd rather just sit this out until at least next week. 8.15am. ADP jobs: 237k... above consensus... bullish.. and now some will start to get twitchy about rate rises again. notable early strength: TSLA +1.5%. Did they sell another car this week? ... still awaiting Tsipras to speak today.... gods know what he'll say this time! 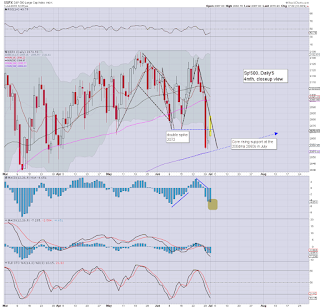 June saw some significant equity weakness, with the sp'500 -44pts (2.1%) at 2063. 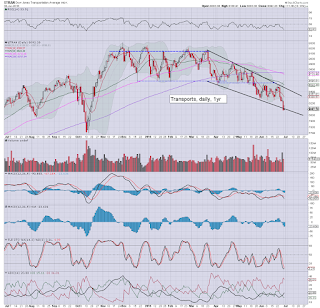 The Transports remain the market laggard, -2.5% @ 8050. 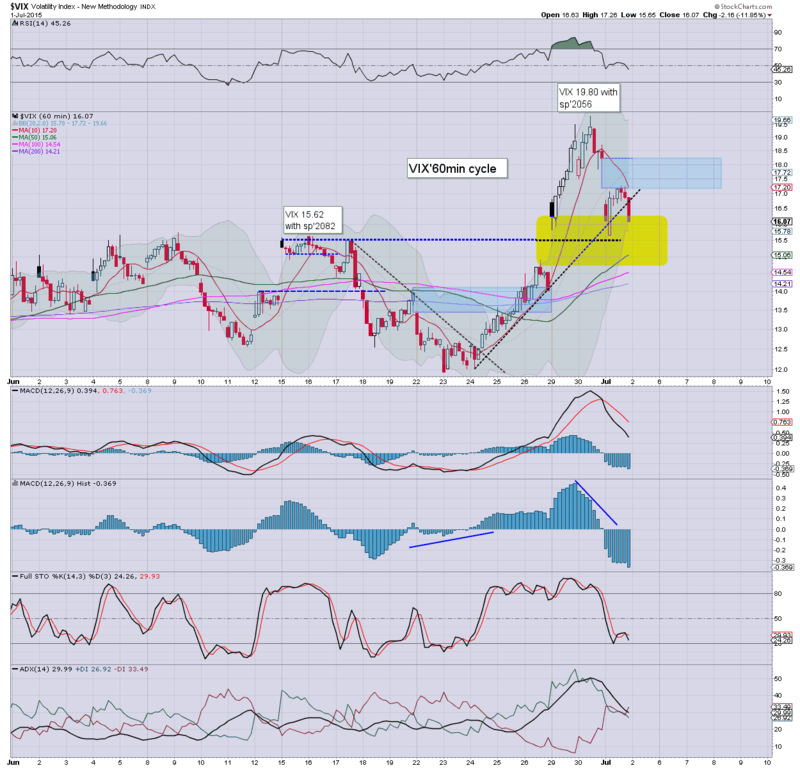 Meanwhile, the USD settled moderately lower, -1.3% in the DXY 95s. 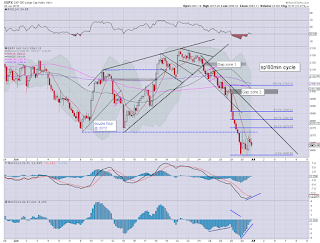 WTIC Oil slipped -1.3% @ $59.47. Wed' will see ADP jobs, PMI/ISM manu', construction, and the latest EIA oil report. US equity indexes closed moderately higher, sp +5pts @ 2063 (intra high 2074). The two leaders - Trans/R2K, settled higher by 0.6% and 0.1% respectively. Near term outlook is uncertain, with hourly cycles threatening further upside, against broader downside. 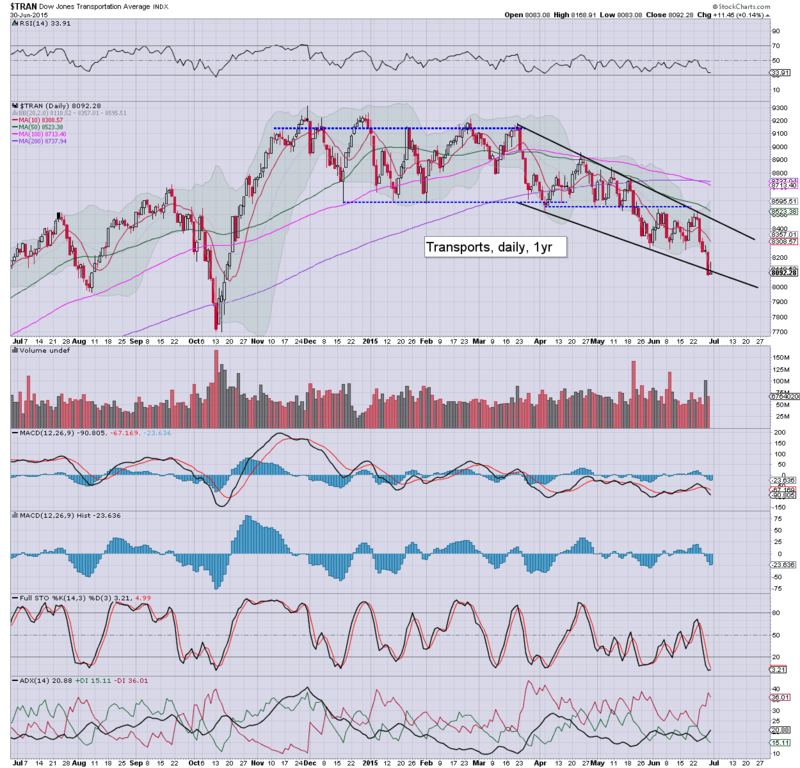 *Trans looks pretty dire on the bigger daily/weekly cycles.. 8000.. or even the 7700s remain a viable target in the near term. Suffice to say, the sp'500 saw a bit of a choppy day, opening higher.. cooling to 2056, but then a rather typical afternoon ramp to 2074. The closing hour was messy... with some natural 'end month' trading issues. Broadly, it would seem the market is going to either hold the 2050s... or see a more sig' break lower to the giant 2K threshold. The next 3-4 trading days should remain pretty dynamic.